Sale-A-Bration time at Stampin' Up! is a great time to order, host a party, or become a new demonstrator. We have a wonderful brochure full of fun new products you can't buy, but you can earn. For every $50.00 (before tax and shipping) you spend with Stampin' Up! you can earn one of these beautiful products. I must admit, so far, the Lotus Blossom Stamp Set is my favorite. It comes as a set of 7 stamps. The flower is a three step stamping process that produces a beautiful flower with three tones. The stem is a two stamp process. The set comes with two sentiment stamps that can be used together or separately. If you host a party during Sale-A-Bration, you can earn an extra $25.00 when you have a party order of $250.00 (before shipping and tax). This is in addition to the normal hostess benefits you would normally earn. If you decide you would like to become a demonstrator during Sale-A-Bration, your starter kit is $99.00 (plus tax) and you get to pick $125.00 in merchandise. As an added bonus for signing up during Sale-A-Bration, there are two options you can choose from for more goodies. You can pick one of the new project kits from the new Occasions Catalog, or any two Sale-A-Bration products. 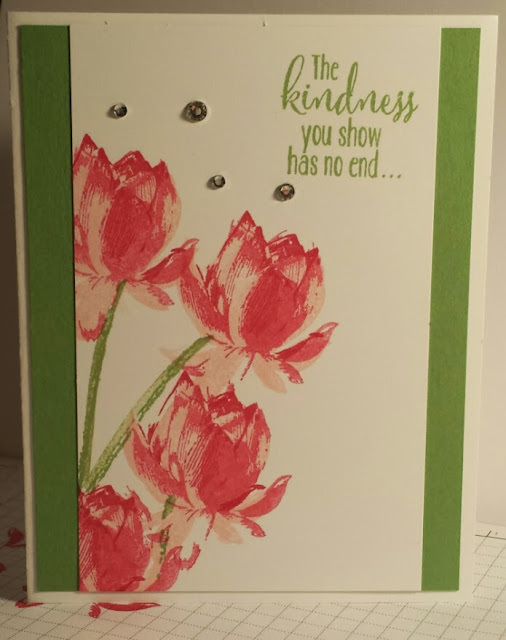 This card was made with the new Lotus Blossom Stamp Set. I started with a piece of Whisper White Cardstock (3 1/4 x 5 1/4). I stamped the first flower stamp in Rose Red. I stamped the second flower stamp with Rose Red stamped off first and then onto the cardstock. The third flower stamp was stamped with Pink Pirouette. The first stem stamp was stamped with Pear Pizzazz. The second stem stamp was stamped with Wild Wasabi. I stamped the sentiment with Wild Wasabi. I then mounted it on a piece of Wild Wasabi cardstock (4 x 5 1/4). This was then mounted to a Whisper White card base (8 1/2 x 5 1/2 scored down the middle). For an added touch I added some Rhinestone Basic Jewels above the flowers.